Hemp root can be used in various forms, including as a natural topical remedy for bone and muscle aches, swelling and generalized pain. It can also help rejuvenate circulation and promote cell growth, as well as encourage deep tissue healing. The healing properties of the root can be found as far back as the writings of Pliny (circa 77-79 CE). The Ancient Greeks wrote about the benefits of the boiled root for muscle aches, broken bones and as a poultice for treating burns. 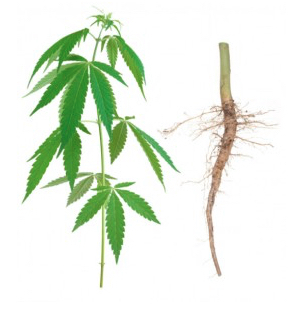 Modern medicine is also rediscovering the amazing properties of hemp root. In 1971, researchers found the roots of the hemp plant contained terpenes, which provide the fragrance for which cannabis is so widely known. Some of these terpenes, such as isoprene [C5H8], have been found to have an expectorant and humectant effect, which makes them viable for bronchial treatments. Friedelin is a terpene specific to the root of the hemp plant, and is just one of the reasons hemp oils are so biochemically diverse, offering relief for many ailments. This particular terpene is analgesic, anti-inflammatory and antipyretic. Arthritis, Burns, Dry/chapped skin, Eczema, Headaches or migraines, Insect bites, Muscle soreness, Pain, Psoriasis, Rashes, Rheumatism, Stiff neck, Swelling, Sunburns, Tendonitis. The healing effects of topical hemp oil treatments go beyond the above ailments. There is now evidence that it may effectively treat certain types of skin cancers. This is due to the previously discussed constituents of Omega 3s and 6s, as well as gamma linoleic acid (GLA). In fact, the concentration of GLA in the hemp plant is 5 percent higher than that of any other known source. GLA promotes healthy skin growth and is effective in helping to treat many ailments and diseases, including cancer of the breast and skin. At this time hemp roots are not readily available for purchase but in the not-too-distant future we see them being used in a variety of topical applications.